Crush about 6 oz. of peppermint candies by placing them in a bag and hammering them or grinding them with a rolling pin. Sieve the crushed candies using a wire mesh or colander to remove some of the smaller fragments. 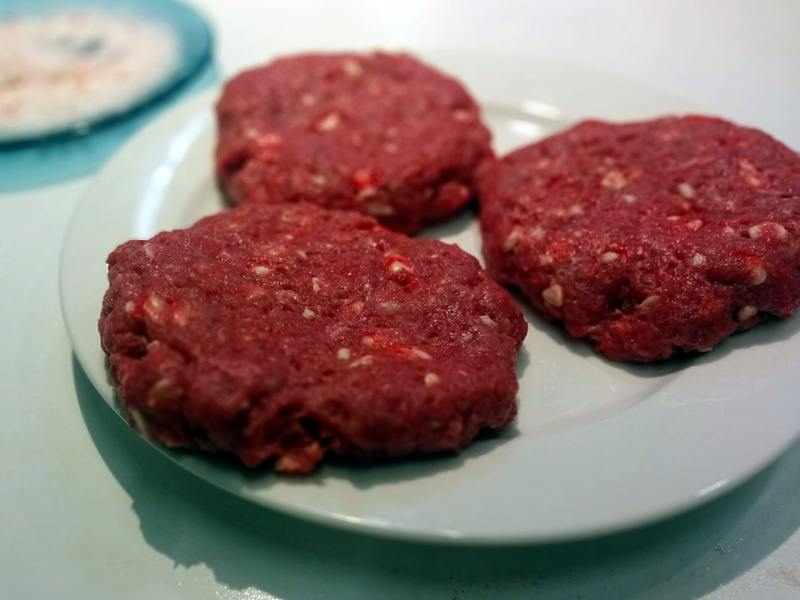 Combine 1.4 lb ground hamburger, 1 egg, 1/2 tsp peppermint extract and the crushed peppermint pieces in a large bowl. Mix until the ingredients are blended well. Shape patties and cook on a skillet or a grill. Because of the high sugar content, the patties will tend to blacken more than regular patties. 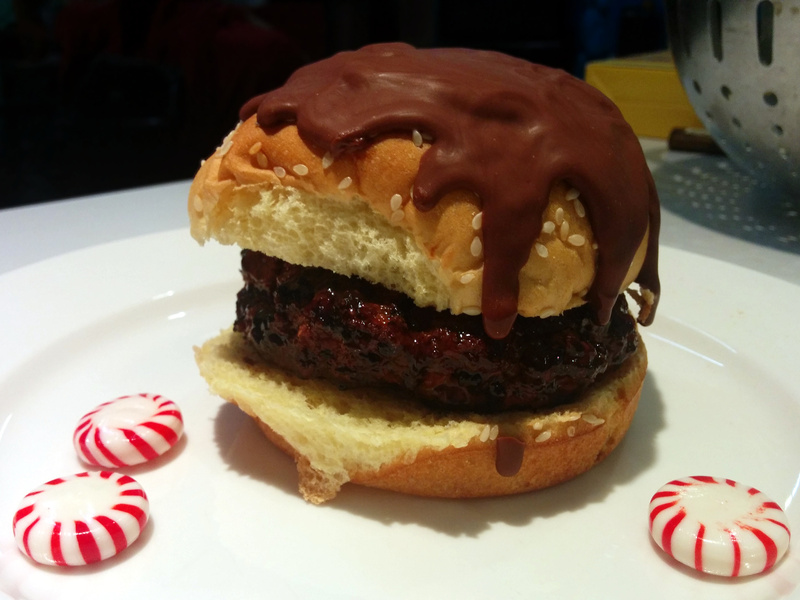 Place on bun and drizzle with chocolate shell topping. Beth: The mint and chocolate flavors and the burger flavors were all very strong, but they didn’t really blend together. It was almost as if my mouth was simultaneously experiencing two different time lines, one in which I was eating a burger and one in which I was eating dessert. It was rather disconcerting at first, but once I got used to it, the experience was just as enjoyable as eating either food on its own. i happily finished my whole burger. I did notice one odd interaction between the flavors — I felt like the sharp taste of the mint amplified the sharp iron taste of the beef, making it taste like the burger was more rare than it really was. This was also disconcerting, but not bad. I don’t have any strong desire to make these again in the future, but I am definitely going to eat the leftovers from the burgers that Kristen and Alex couldn’t finish. Kristen: I was a bit skeptical of the combination of sugar and meat without some sort of accompanying spiciness or sourness to hold the competing umami and sweet flavors together, but I told myself that I’d be able to say I gave peppermint hamburger patties an honest try if I just swallowed one bite. Well, I couldn’t force myself to swallow even half a bite and ended up spitting it out. It was not just sweet but also syrupy, which hurt the texture. Beth can have the rest of mine. Beth: (Upon trying the leftovers cold) When cold, these are actually delicious. Alex: I still don’t like it, but it no longer fills me with revulsion.